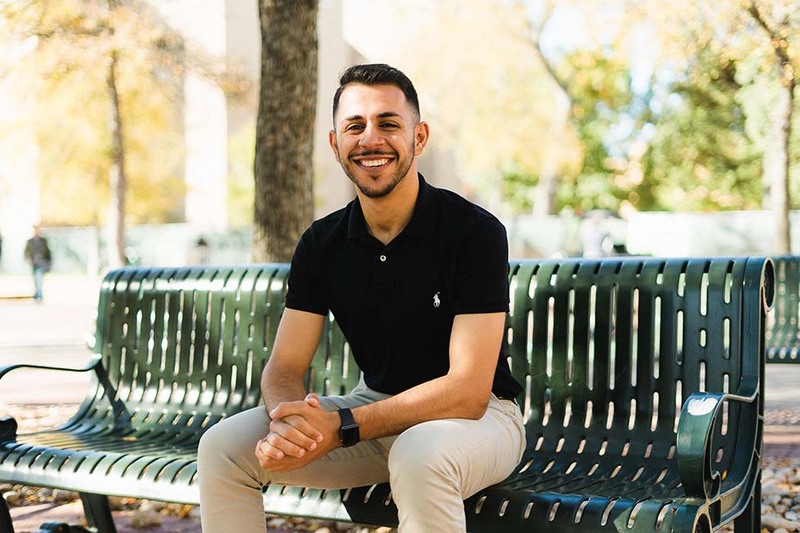 With his sights set on one day living in Washington, D.C., and creating educational reform in the U.S., Student Government Association (SGA) President Muhammad Kara is currently focused on making changes for all UNT students in Denton, Texas. Born in Istanbul, Turkey, and raised in Dallas, Kara was already familiar with UNT since his sister is an alumna, but it was the university’s welcoming environment that sealed the deal for him. “Whenever I came on campus, I was treated warmly and could tell that UNT cares about students,” said Kara, who decided to pursue a degree in integrative studies with concentrations in international studies, political science and public administration. Wanting to become involved on campus, Kara first joined SGA as the chief of staff, and he decided to run for president feeling that he had more to offer. During his term, Kara is focusing on three main areas: revolutionizing the election code to make elections simpler for all students; meeting students where they are and not waiting for them to come to SGA; and offering free feminine hygiene products to students. Kara admits that his biggest challenge as SGA president is representing all UNT students. “I need to be aware of and ask myself how SGA decisions will affect all students, both those in the majority and those who have been marginalized,” he said. Kara’s plan appears to be working, and the SGA office is booming with students who are now feeling comfortable expressing their concerns. Issues that have arisen include students wanting to see more diversity among faculty and staff, more flexible hours for the dining halls and more funding for student programs. In addition to his work with the SGA, Kara currently serves as chair of the Distinguished Lecture Series, co-chair of the Fine Arts Series Committee, a Student Alumni Ambassador and a member of NT40. Of course, his academic career and passion for education are always at the forefront, and after his graduation in May, he hopes to earn his master’s degree in public administration from Georgetown University and one day work in the U.S. Department of Education focusing on the policy realm. His goal is to make substantial change to education and make it more accessible to minorities. Thanks to his education and experiences at UNT, Kara feels that he is ready to meet the challenges that lie ahead. With his passion and drive, it is likely Kara will one day be adding the title U.S. Secretary of Education to his already impressive list of achievements. But regardless of his career path, he will undoubtedly continue to make UNT proud.